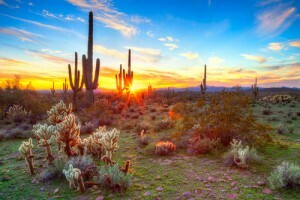 Arizona is known for its dry desert climate, with an average of 7 inches of rainfall per year. For its residents, this means one sunny day after another. The abundance of sunshine, combined with the growing need for alternative energy sources, has created a surge of solar power throughout the state. Why Solar Power in Arizona is Wise? Arizona is in a prime position in regard to rooftop solar technology. While it is not absolutely necessary for a state to have constant sunshine for solar to work, it does help the entire process. If you consider that 8.2 million quads of solar energy hits the earth each year, it stands to reason that Arizona’s climate reaps their fair share of that total. With all of the readily available solar power, it is a wonder that we only use 400 quads of solar energy annually throughout the world. The mountainous northern areas of Arizona, which have a different weather pattern than the south, are able to soak up this solar energy just as efficiently. On average, the state of Arizona receives 8 kilowatt hours of solar energy per day. Compare this to the average of 4 kilowatt hours per day that the rest of the United States receives, and we can see that Arizona has the clear advantage. The best way to know how much you can save in Arizona with solar power is to talk to one of our recommended solar installers and get a solar quote for free. A strategic plan for increasing the level of renewable energy used in Arizona was created in 2001. This plan, known as the Arizona Renewable Portfolio Standard (RPS), stipulates that the Arizona utilities companies must procure 15% of the total amount of energy provided to the state from renewable resources by the year 2025. When the Arizona Corporation Commission adopted the RPS, in essence it forced the cooperation of the utility companies. This was an ingenious move, as the two major utilities services in Arizona stood to be the main competition to statewide increased solar use. Tucson Electric and Arizona Public Service are monitored regularly to ensure that they are making adequate progress in meeting this goal. The entire state of Arizona is benefiting from the forcing of the utilities companies to supply and use solar power. Changes have been made to the Environmental Portfolio Surcharge so as to assist the various companies in meeting this 2025 goal. Is Solar Really a Savings? The use of any clean and renewable energy is a known and needed aid to the planet. However, many individuals are skeptical or unaware of the actual fiscal savings to their homes and households. While every home’s costs will vary depending on size and efficiency, the cost of traditional electricity can be immense in the hottest months. Even in the cooler months Arizona can be warm. It is not unheard of for one home to spend over $500 in August, simply due to the cost of cooling. From 1998 to 2010, the price of residential electricity in Arizona jumped from 8.5 cents per kilowatt hour to 11 cents per kilowatt hour. In the last five years, that number has only increased. With a properly installed solar PV panel system a homeowner can save as much as 70 to 100 percent of their total electric bill. If those homes that normally spend $500 could instead pay $150 or less, the choice to switch to solar power is clear. When Will a Solar PV System Pay for Itself? The answer to this is a matter of perspective. Globally, the use of solar powered energy will have a quick and drastic impact on the earth. Supplying and relying on only solar power world-wide sounds like an impossible task. Yet, keep in mind that we would only need to cover 0.0005% of the earth with solar panels for the entire world to effectively run on solar. On the same note, if we made this global switch, we could reduce our crude oil consumption by over 75 million barrels each year. Again, this is the big picture. Many Arizona residents need to see the local effect that a solar system can have. Powering an average sized home requires a roughly 600 square foot solar panel system. The average cost of a system this size is $55,000, before any applicable rebates or tax incentives. Based on current utility costs and available incentives, the average homeowner can expect for their solar panel system to pay for itself within 7 years. To figure out exactly how much you can save and the costs involved, our advise is to connect with solar installers and get an accurate free solar quote. The Arizona P ublic Service Renewable Energy Incentive Program offers a rebate of roughly $2.00 per watt of solar energy consumed. This rebate is applicable to homeowners both on and off of the utility grid. The Tucson Electric Power SunShare Program offers a rebate of $3.00 per watt for homes tied to their electric grid, and $2.00 per watt for those persons off of the grid. These are two of the more commonly used solar rebates in Arizona, though there are six in total. Every homeowner in the United States qualifies for a Federal Tax Credit on the purchase of their solar powered system. This credit is equal to 30% of the total cost of the system. While the credit can only be used once, there is no cap on how much that 30% can amount to. Arizona offers its resident homeowners a State Tax Credit of 25% of the solar powered systems cost. This credit has a cap of $1,000. In the state of Arizona, adding a solar power system is not considered to add value to the property. What this means is that the homeowner will not be taxed on value that is added to the home. Therefore, the addition of a home solar power system will not add to the homeowner’s property tax. When you pay to have a solar power system installed in your home, you will not have to pay the sales tax on the purchase in Arizona. This tax incentive is set to last until 2016. This exemption is of even greater value than the property tax exemption, as the total cost of the system increases the amount of sales tax to be normally paid. Throughout the state of Arizona there are options for financing a new solar powered system. Many Arizona residents choose to have an Energy Efficient Mortgage on their home. This type of mortgage is funded through the federal government, and is often easier to qualify for than a bank fed mortgage. This environmentally friendly mortgage is only available to persons wanting to improve their home’s energy efficiency. Some areas offer Local Government Loans which allow you to purchase and install solar powered equipment in your home, and then repay the loan via your property tax. You do not own the equipment until the loan has been completely repaid. If you leave the home before complete repayment, the equipment will stay with the home and payments will transfer to the next owner. The most common form of solar powered system financing is a bank loan. These loans can be either unsecured or secured, using the equity on your home as collateral. For homeowners who need assistance with purchasing a solar powered system, but want to own their equipment from the start, there are a number of $0 Down “green loans” offered to Arizona’s residents. The stipulations on these loans will all vary. Some require a certain FICO score, while others require existing home equity. Leasing Vs. Purchasing: What’s best for Arizona Residents? For homeowners that cannot afford the initial investment of a solar powered system, leasing the solar panels from a reputable company is a great option. There are only 8 states that offer a solar lease currently, and fortunately Arizona is one of them. Through the leasing system the homeowner pays a monthly fee for the use of the solar panels. A solar lease will last an average of 20 years. At the end of the lease the homeowner can sign for a new lease, give back the system, or purchase the system outright. To locate a local solar lease provider, click here. Either option of purchasing or leasing can be beneficial to Arizona’s residents. The leasing option offers programs with no money down. The leaser will also handle all of the maintenance of the system on your home. If there are any issues with aging or wear they will be replaced with no out of pocket costs on your part. When you choose to purchase a solar powered system, you will have to pay for the investment yourself, however then you own it for life. While the initial investment is much greater through purchasing, you will save more money per month by not having lease payments. Net metering is a process that allows homeowners who are connected to the utility grid to use both standard electricity and their own solar powered energy systems. A meter is placed on the home that is capable of measuring not only the home’s energy expenditure (power used that the utility company will charge for), but also the amount of energy being absorbed (through the solar system). If the solar energy offsets the power grid energy, they will cancel each other out. Even if you have a small solar powered system, the rate of solar wattage that you take in can decrease your total electric bill. Where this turns into a profit making system for homeowners is in the states like Arizona which also allow for the average of absorbed solar energy to be sold back to the power companies. There has been some concern and speculation in regards to Arizona’s net metering as new fees have been imposed on the users. However, the fees are there to ensure that the power company is not spending too much money on paying the citizens for power, therefore making it financially unfeasible to reach their RPS goals. The persons who regulate utilities in Arizona are working to complete a feed-in tariff for solar energy within the state. The signing of this tariff would ensure that utilities companies are required to purchase their electricity from solar powered developers. Having this system will increase the amount of profits made by the solar developers, which can in turn be used for additional solar infrastructure. 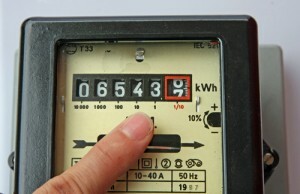 A feed-in tariff allows for the utility companies to pay a prearranged price for the energy they buy. Having a contract signed at a prearranged price allows the developers to garner more investors. Arizona is more primed and ready for state-wide solar power than most states. The many organizations and departments who are pushing for a national clean energy change have made it more appealing to the public through incentives and credits. The facts and statistics add up to an alternative energy source that is not only good for the environment, but also a relief to the residents of Arizona. You can find a recommended professional local solar and get a solar quote here. The solar pros will be more than happy to show you exactly how much you will spend and how much you will save.